National University Masters Final Year Result Challenge Application. 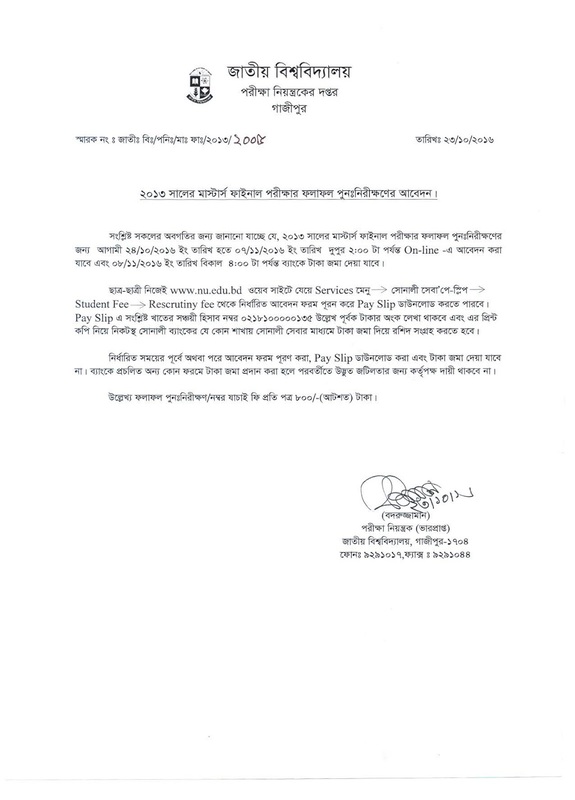 The Authority of National University Published a Notice About NU Masters Final Year Result Challenge Details Process. NU Result Challenge System Completed by Online. NU Masters Last Year Exam Result 2013 Was Published 09 October 2016. Now NU Authority Declared a Notice About Result Challenge for Masters Final Year Exam Result. See Details About Result Challenge System. Thought a Huge Number of Candidates Attended masters Final Year Exam. Result Was Published 09 October 2016. However Many of Students Think That, They May not Get Right Result. So They want to Apply For Challenge Result Change. NU Give The Opportunity To Challenge Result. Don’t Think Much, If you Want To Challenge Result, They Do it. Candidates have to Apply for Result Challenge Online. Masters Final Year Result Challenge Application Will be End 07 November 2016. at first Candidates have to Fill Up Application Form and Then have to pay Application Form Fee Using Sonali Bank Sebha. To Apply Result Challenge Follow Below Link and fill Up Form. After Complete Fill Up Form, Print Your Application and Submit it To Sonali Bank. Go To nu.edu.bd Site Then Select Services and Click sonali Sebha Pay Slip. Now Select Students Fee and Click Re-scrutining and Fill up Form. Masters Final year Result Challenge Application Notice Will Found Here. National University Masters Result Challenge Application Result Will be Found here. When The Authority Published Result We Update here. Share the post "National University Masters Final Year Result Challenge Application & Result"